A fearless Roman gladiator. A reckless twenty-first-century girl. A mysterious virus unites them . . .
152 AD. Sethos Leontis, a skilled and mesmerising fighter, is unexpectedly wounded and lies dangerously close to death. 2012 AD. Eva is brilliant - but troubled. Starting her new life at a school for the gifted, a single moment in the lab has terrifying results. An extraordinary link brings Sethos and Eva together, but it could force them apart - because the fever that grips them cannot be cured and falling in love could be lethal . . . Can love survive when worlds collide and threaten time itself? The first book in a brand-new series by Dee Shulman. This is the second Dystopian novel that I've read and if I'm honest I wasn't sure what to expect from 'Fever'. Eva's passages had me hooked from the word go, whereas Seth's took a while to entrance me. I loved the differences in the centuries between them as it made each part of the story so diverse. Seth- a gladiator loved by most women. He can have any woman he wants, but he chooses the one he cant have Livia. Seth is mesmerised by her and he nearly gets himself killed by holding her gaze. Each time Seth and Livia meet the tension is more and more explosive. The sexual chemistry between them is apparent from that first gaze. The description of their kiss is passionate and extremely intense. Eva is a geeky teen who enjoys hacking technology-usually her schools computers. I loved Eva from the word go, she's different to your average teen. The sad thing is she didn't have a proper friend until she went to St Magdalene's and met Ruby. Ruby is a bubbly, loveable character well this was my first thought of her. The description of the 'Fever' itself is compelling and well written, as a reader you would occasionally find yourself remembering the last time you were sick, and how you overcome the temperature. Each time a character goes through this excruciating pain as a reader you can emphasise with them. Dee has written this gripping novel so well, I didn't realise it would be part of a series. 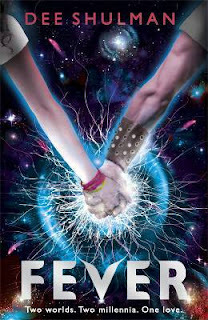 What I also loved about 'Fever' was that St Magdalene's is a London based school, as many YA novels are American based. I loved the feeling I got when I saw the merging of the stories. There was definitely some 'lightbulb' moments from me. As the novel nears the end there are a number of shocking twists that will have you on the edge of your seat. As a reader you won't see them coming, but when they do they make complete sense. The funny thing is after you've discovered the twists they seem blindingly obvious. The description is so addictive, it has you hooked wanting more, turning page after page as each sentence is more intense than the last. I don't know what to expect next, but it's safe to say I'll enjoy the ride in finding out. Great review, but on the down side you have made me crave for it! I have to read this now!